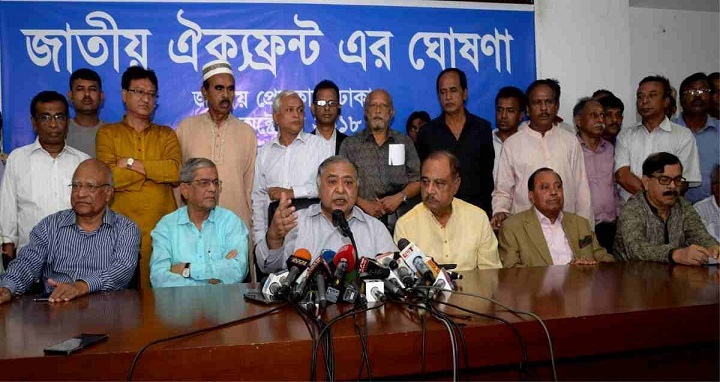 Dhaka, 13 October, Abnews: BNP, Jatiya Oikya Prokriya and Jukta Front on Saturday launched a new opposition alliance, ‘Jatiya Oikya Front’, ahead of the 11th national election without Bikalpadhara Bangladesh President AQM Badruddoza Chowdhury. The new alliance envisages realising seven demands, including the release of BNP Chairperson Khaleda Zia, and meeting 11 targets. Nagorik Oikya Convener Mahmudur Rahman Manna made the announcement at a press conference held at the Jatiya Press Club in the evening with Jatiya Oikya Prokriya convener Dr Kamal Hossain in the chair. He hoped that AQM Badruddoza Chowdhury-led Bikalpadhara Bangladesh would also join the new alliance later. Two leaders of Badruddoza Chowdhury-led Jukta Front, JSD President ASM Abdur Rob and Mahmudur Rahman Manna were present at the press conference. However, Badruddoza Chowdhury was not present at the press conference. BNP Secretary General Mirza Fakhrul Islam Alamgir, its standing committee members Khandaker Mosharraf Hossain and Moudud Ahmed, former caretaker adviser Barrister Mainul Hosein and Dr Zafrullah Chowdhury, former vice president of Dhaka University Central Students’ Union (Ducsu) Sultan Mohammad Mansur Ahmed were present at the press conference.